The great Cuban singer Omara Portuondo is one of the most important guests of the twenty-first edition of the Barranquijazz Festival. Presenting her latest tour "85 Tour", Omara will be joined by Spanish singer Martirio. First time Omara was at Barranquijazz was in 2009, with a standing ovation at the end of the show. Bith artists will perform greatest Cuban hits nenxt September 15th. Learn more here. Omara Portuondo is in great shape and all the audience gathered last Saturday at the Maria Angola Convention Center in Lima (Peru) witnessed an unique performance . Cuban diva delighted the audience with beautiful interpretations of great classics such as "Veinte Años", "Dos Gardenias" or "La Sitiera" among others. Omara posted the best pictures of a great night on her Facebook page. Learn more here. Cuban singer Omara Portuondo will join the stage with singer Olga Cerpa in Canarias (Spain). Two unique concerts that will bring the best music from both sides of the Atlantic. Learn more here. 85 Tour NEW DATES CONFIRMED! Cuba diva starts rhe "85 tour" with a series of shows confirmed in Europe. Click here and see the nearest one to your city! 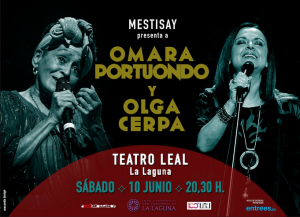 Omara Portuondo and Barbarito Torres are great friends and they are going to get together to celebrate music with a National Tour visiting: Santiago de Cuba, Guantánamo, Bayamo y Holguín. Learn more here.